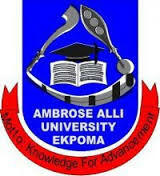 Ambrose Alli University Ekpoma Interim Joint Matriculation Board Examination, IJMBE Admission Form, Courses, Subject Combinations, Admission Requirements, Duration and Application Guidelines for 2018/2019 Academic Session. The Interim Joint Matriculation Board Examination (IJMBE) is a national examination body approved by the Federal Government of Nigeria and fully certified by Nigeria University Commission (NUC) as an alternative to ‘A’ level Examination, for candidates who may wish to seek for undergraduate admission into Universities both in Nigeria and abroad. The IJMBE programme was envisioned as a stop-gap or bridge after secondary school education, which will prepare candidates academically, mentally and socially for the challenges of University education. The programme runs for a period of twelve (12) calendar months divided into two (2) semesters. Each candidate for the IJMBE programme is expected to offer three (3) combinable subjects at the Advanced Level relevant for pursuance of a University degree on successful completion of the IJMBE programme. These combinations relate to Direct Entry requirements for various programmes of study in the university as specified in the JAMB brochure. Applicants must possess at least five (5) credit passes in not more than two (2) sittings in SSCE/WASC/GCE O’Level/NECO/NABTEB which must include English Language and Mathematics. At least, three (3) of the credits must be in relevant subjects. Candidates who have successfully completed the IJMBE programme may seek admission into 200 level in Ambrose Alli University or any other Nigerian University via JAMB Direct Entry (DE) form. IJMBE result does not require JAMB UTME/Screening Exercise for admission. Candidates may also use the IJMBE results, being an Advanced Level qualification similar to Cambridge or London Advanced Level qualifications, to seek admission into foreign Universities. Please visit the University website: www.aauekpoma.edu.ng and portal via https://aaue.waeup.org for details on purchase of form and procedure for application.